Very little, so far as we are aware. Yet that didn’t stop tongs of proud geeks and self-confessed nerds from descending upon Tosy’s tiny corner of the Las Vegas Convention Center and jostling for the best position to get a glimpse of the star. Not that most of the crowd could recognize him. “Which one is he?” a Microsoft employee behind us asked. “The one in the pink and grey stripped shirt.” a helpful person said. “No, I think maybe he’s the one in the brown hoodie,” suggested one one else in the crowd. “Who’s Justin Bieber?” asked another. It isn’t as pornographic as it sounds. 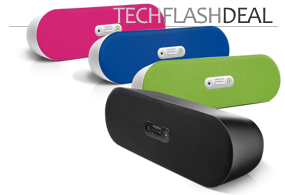 The robot features 2GB of internal memory onto which music can be loaded via a USB slot. 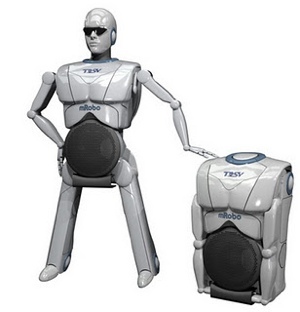 Choose a song for the mRobo to play and it will dance along to the beats. That’s more impressive than it sounds given that the mRobo dances using bipedal motion and is able to bust moves similar to those a human would.